Hello! 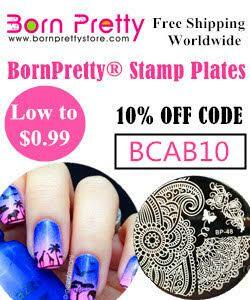 Today I have two sets of decals to show you from UK brand iZ Beauty of London. They were kind enough to let me choose designs of my choice, and I couldn't wait to get stuck in and play with them. 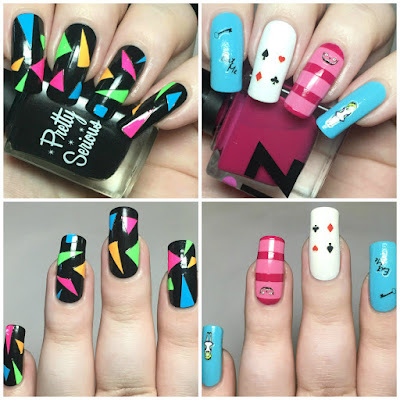 I created a nail art look with each set for today's post. Read on for a closer look and more info! 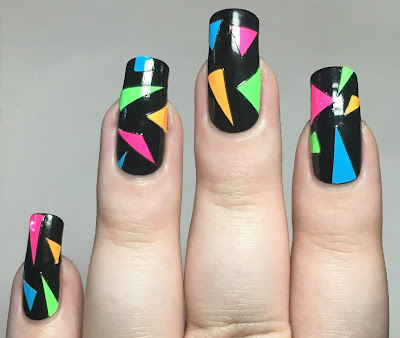 First up, I chose their Neon Triangle/Geometric Nail Decals. I do love a good pop of colour. I decided to layer these over a black base (Pretty Serious Cosmetics 'Absense') to make the neon colours stand out. I randomly placed several of the decals to each nail, trimming off any excess. They were very easy to use - I gently peeled them off of the backing sheet, and using a pair of tweezers placed them onto my nails, before gently smoothing them down. The second set I chose are these Wonderland Inspired Decals. 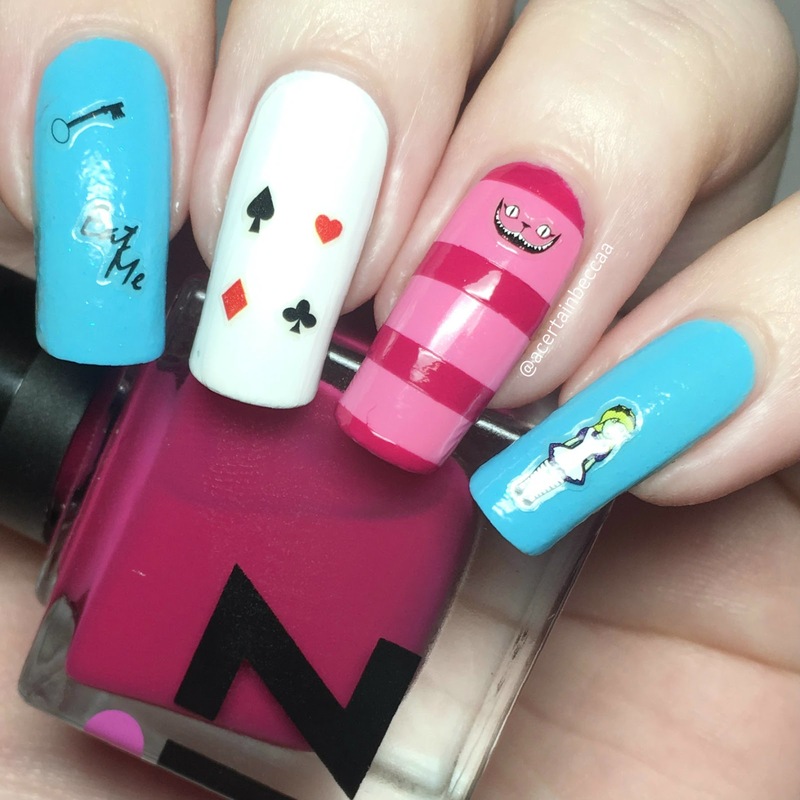 Anyone who knows me knows I love Alice in Wonderland, and absolutely cannot resist Alice themed nail goodies - so these were a no brainer! For my Alice mani, I started off painting my ring and little fingers blue (with Pretty Perfect Polish 'Curiouser and Curiouser..', full swatch coming soon! ), my middle finger white, and my ring finger pink. 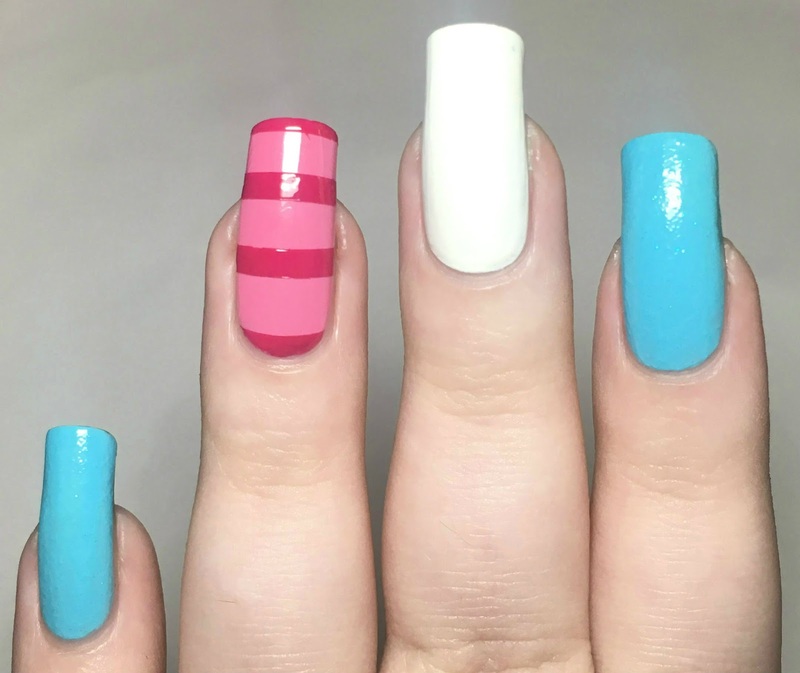 I then added darker pink stripes onto my ring finger using striping tape and iZ Beauty's own 'Fuchsia Infusion'. I then added some of the Wonderland Inspired Decals to my nails. Again, they were super easy to use and stayed exactly where I put them. What do you think? I'm really impressed! I appreciate the fact that these are slightly more like nail stickers than decals, and don't require any water at all - you simply just peel them off the sheet and pop them on. I kept my Alice inspired mani on for several days (it's actually what I have on my nails now) and the decals haven't budged, even without topcoat. You can find both sets of decals mentioned (along with many others) on the iZ Beauty of London website - the neon triangle set for £4 here, and the Wonderland set for £2 here. These are so pretty! I love both these manis. 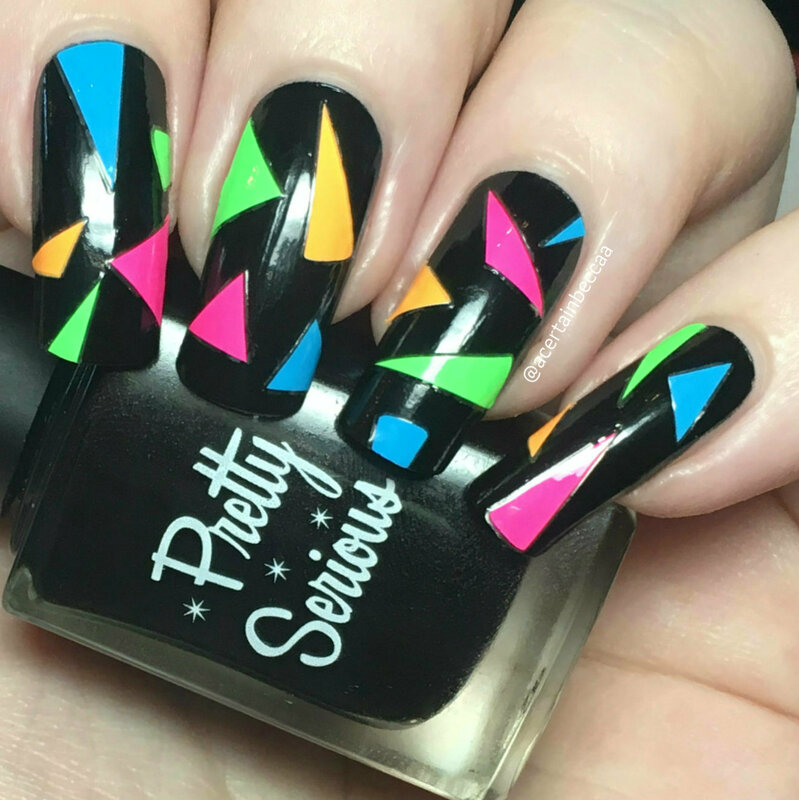 They're bright, bold and so fun. Love this. Expecially the Cheshire Cat, my only problem would be I would like to see the Alice decals a little larger. Maybe they could bring their decals out in two sizes? ?